LESS TIME ON THE EHR. Take a look at Dr in Cloud®, our Electronic Health Record. Configurable templates for any speciality. Beautiful and very easy to use. Powered by Microsoft Cloud, the most Secure, Reliable and Trusted worldwide. The only one to include a powerful marketing system at no extra cost. Most Secure Cloud Storage. 99% Uptime. Lightning fast. See why high-performing practitioners and medical groups choose our integrated clinical, practice management and patient experience solution. True partners in your success. We have integrated DrinCloud Practice Management Software with other applications so that your business can have the best of everything. Allow your patients to sign Consent Forms and Invoices in your iPad or Tablet. Our Monitoring System works with Apple to collect health data from your patients and securely send it to your medical record. Create a website in minutes. Beautiful and incredible pages with no coding. Income, expenses and invoices done with DrinCloud are sync with SAGE for tax purposes. Your patients can now use Top Doctors website to schedule online appointments in real time. DrinCloud partners with Uber to transport your patients to your practice. Our practice management approach focuses on results, getting practices increase their revenue more than 42%. Installation and maintenance NOT required. Access Dr in Cloud from your Mac, PC, Smartphone or Tablet, from the clinic, on the road or from the comfort of home and start working on the best Practice Management Software. Take the tour NOW ! Don’t waste any more time searching, start your experience here with DrinCloud, today! What is an electronic health record (EHR)? An electronic health record (EHR), or electronic medical record (EMR), is a systematized collection of patient data and electronically-stored health information in a digital format. It may contain patient’s contact information, information about visits to healthcare professionals, medical history, diagnoses, information about any conditions or diseases, medications, treatment plans, immunization dates, allergies, radiology images, and laboratory and test results. The role of EHRs is becoming increasing influential as more patient information becomes digital and larger numbers of consumers express a desire to have mobile access to their health records. More information about the EHR and Medical Records in Spanish can be found here: software medico. What are the benefits of Electronic Health Records (EHR)? The ability to automatically share and update information among different offices and organizations. More efficient storage and retrieval. Patient data and documents are never lost. The ability to share multimedia information, such as medical imaging results, between locations. The ability to link records to sources of relevant and current research. Easier standardization of services and patient care. The ability to aggregate patient data for population health management and quality of care programs. Provision of decision support systems for healthcare professionals. Long-term lower costs to medical systems. EMR vs EHR – What is the Difference? Electronic Medical Records (EMRs) are a digital version of the paper charts in the clinician’s office. An EMR contains the medical and treatment history of the patients in one practice. EMRs have advantages over paper records. Electronic Health Records (EHRs) do all those things—and more. EHRs focus on the total health of the patient—going beyond standard clinical data collected in the provider’s office and inclusive of a broader view on a patient’s care. How can Dr in Cloud increase my revenue? DrinCloud will lower your management costs since you will not need to buy or maintain computers, backup systems or servers. DrinCloud’s marketing tools will allow a bigger market share. More information. DrinCloud invoicing and billing tools easily increase collections from patients and insurances and follow unpaid receipts until collected. 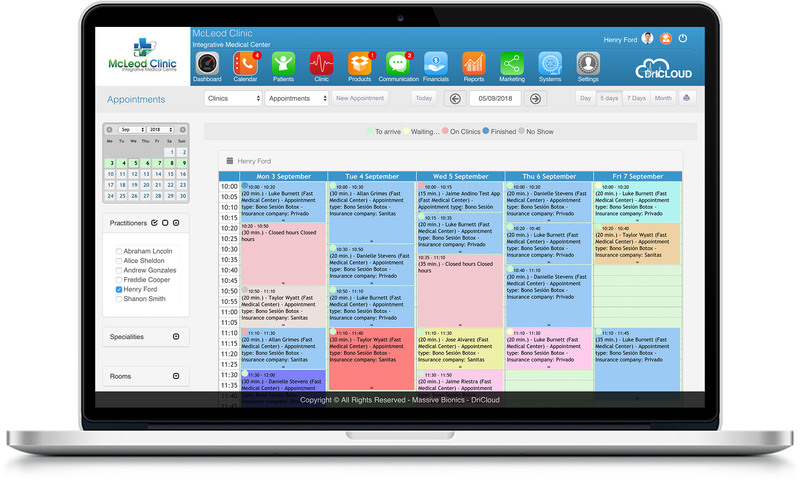 Tools like Monitor, Kiosk, Check in/out, online appointments, automated reminders, appointment cancelation management, our free app for your patients… will increase patient satisfaction, eliminate the “no shows” and improve speed at work. Can I customize the treatment notes and medical records? Sure. 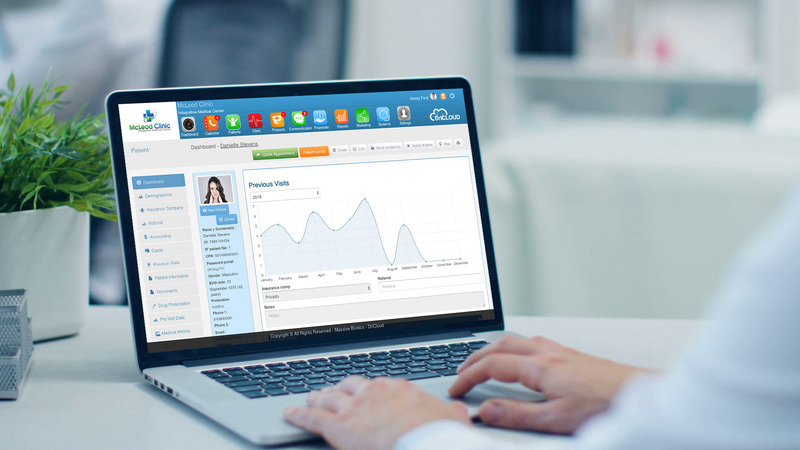 DrinCloud allows you to create fully customized treatment notes or medical record templates. You will have the possibility to create multiple template forms and then choose the one that fits the most for each patient. While creating the template, you can change the position of any field, add or remove fields, predefine text in some fields so you do not need to write each time the same, images to paint over… anything!. Create your account in just a few seconds. When your free 30 day trial is ending, choose your plan and add your billing details to continue your subscription. Absolutely not! There is nothing to pay to get started. We don’t even collect payment details unless you decide to continue after the trial. Can I send automated appointment reminders? Sure. DrinCloud offers FREE Phone Push and Email reminders that are set and forget. Messages go out at the time you make an appointment and again the day before the appointment. DrinCloud is completely web based software, so you don’t need a server or network. You will need an internet connection for each of your computers (Mac or PC) or devices. There is no setup or installation required, it just works. Moreover, you can download our free app to access the DrinCloud’s Practice Management software from your iPhone or iPad, with secure TouchID and FaceID.